Some exciting news for you today! It's Blog Hop time!! Today we are CASE-ing (Copy & Selectively Edit) the wonderfully talented Cindy Schuster, who is also joining us on this hop! I hope you find great inspiration from all the projects in this hop. You may be starting the hop here at my blog (Jessie Holton) or you may have come from the previous person on the list. Be sure to click on the next person in the list to continue your blog hop adventure casing Cindy's work. I love the copper panel on Cindy's card, so I've made my own using the Happy Heart Embossing Folder on Pink Pirouette cardstock (also used for middle layer & base) & then gently wiped Versamark over the top before using the Heat Tool with Copper Embossing Powder. 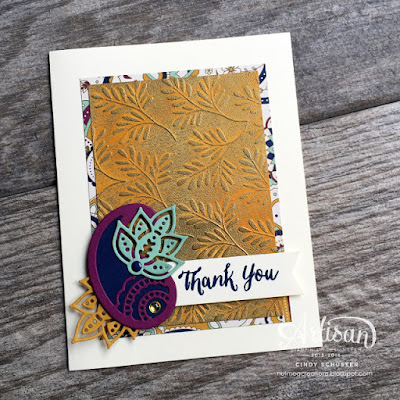 I put that on Dimensionals & also added a layer of the Falling in Love Designer Series Paper from the new Occasions catalog (sign up for your Free Copy here). The little Love sentiment is from the Lift Me Up stamp set & die cut with the matching framelits. This Bundle is also from the new Occasions catalog. I've propped up the little heart with a Dimensional underneath. I have added a big double bow with the Sweet Sugarplum Glitter Ribbon, Very Vanilla Ribbon (from the new Occasions Catalog) & some Copper Metallic Thread. I've adhered it to the card with a strip of Tear & Tape. I have matched the inside with the heart & another sentiment from the Lift Me Up stamp set in Copper Embossing, on a layer of Whisper White cardstock.